Scratchbuilding this Navigator model has been something I've wanted to do for a long time. 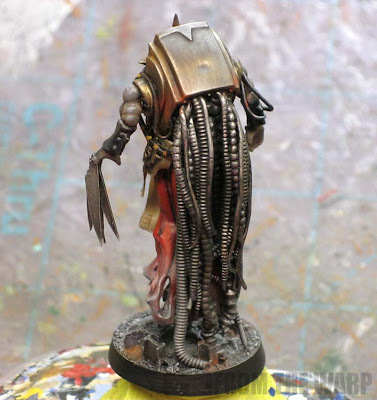 I've actually got a few models I want to try and build like this that come from images I've found in the 40k universe. 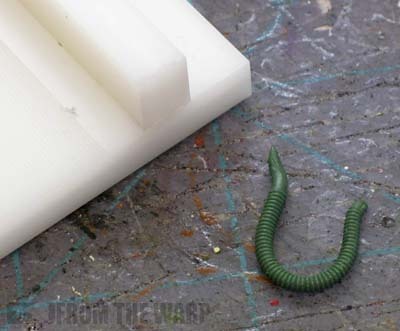 After getting my hands on the new tentacle maker (I now have all three sizes) from Green Stuff Industries, I knew I was finally going to try and build this guy. Unfortunately, my scratchbuilding skills are not the best, but I think I've managed to capture a little bit of the feeling of the artwork. 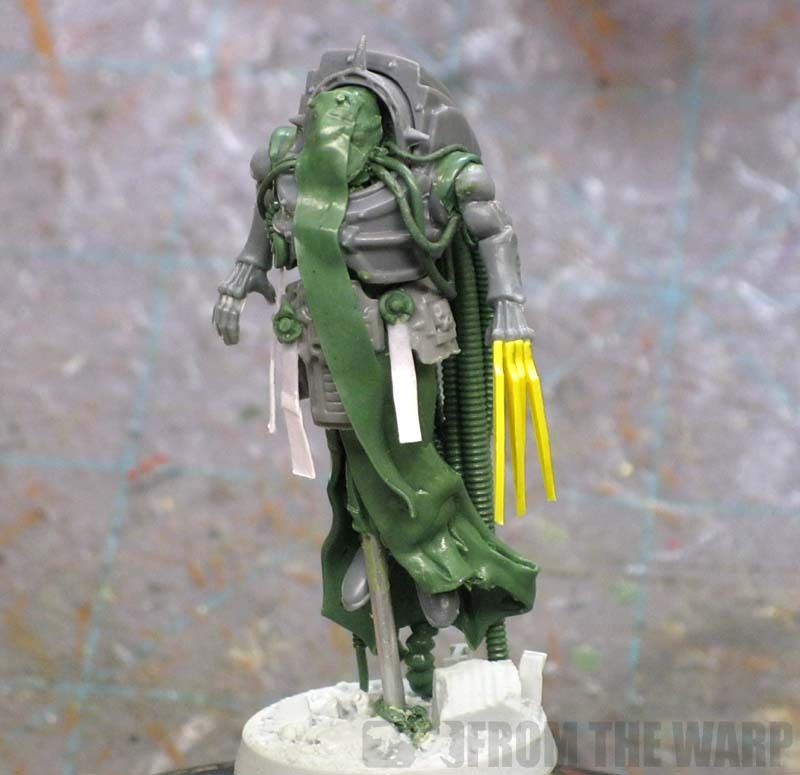 I've always wanted to build a Navigator/Mystic type model with all kind of tubes and cables coming from his shell. 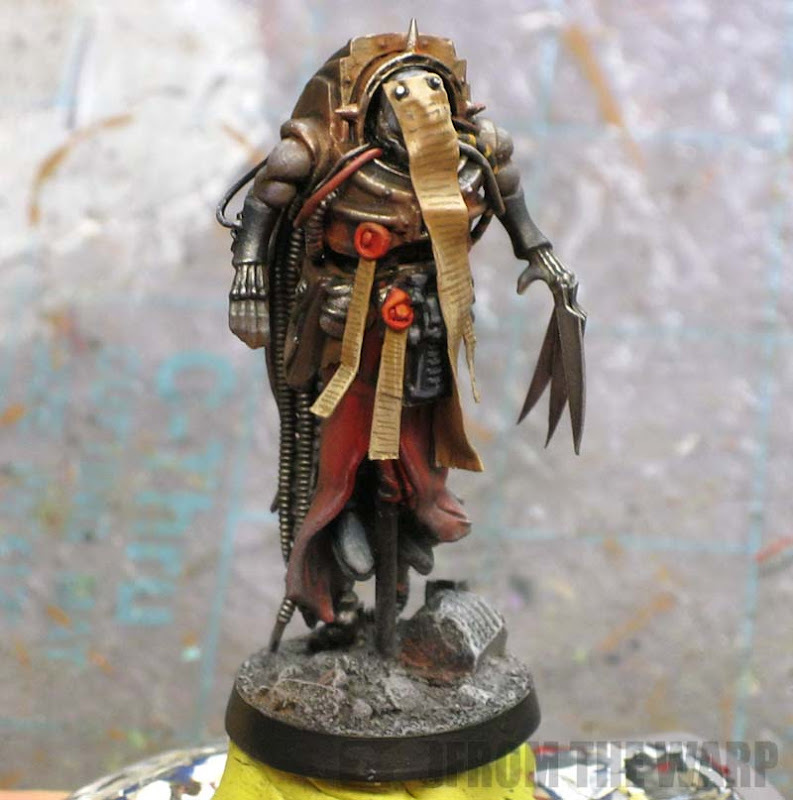 Not something you'd see very often in an army, but something that looked super cool. I knew it would have been too hard to do without the right tools and when I got my hands on all three of the tentacle makers, I figured it was finally time to try my hand at making this guy. I like a challenge, but this model would have been too much to try and do by hand. The body is a Chaos Terminator torso and the rest of the bits have been collected from my bits box. When I say the rest of the bits, I mean his Eldar biker arms, the two space marine terminator hip plates and the Chaos space marine bolt pistol/grenade bit. The rest of the model is greenstuff. This is my second attempt at "scratchbuilding" a model. My first attempt was a Tyranid Spore mine that came out pretty good for a non-Tyranid player. It was relatively easy though because of its organic characteristics. That made it a very forgiving model to try and build. I'm slowly working my way up towards a more complex model that requires a substantial bit of work, but it's going to take time. 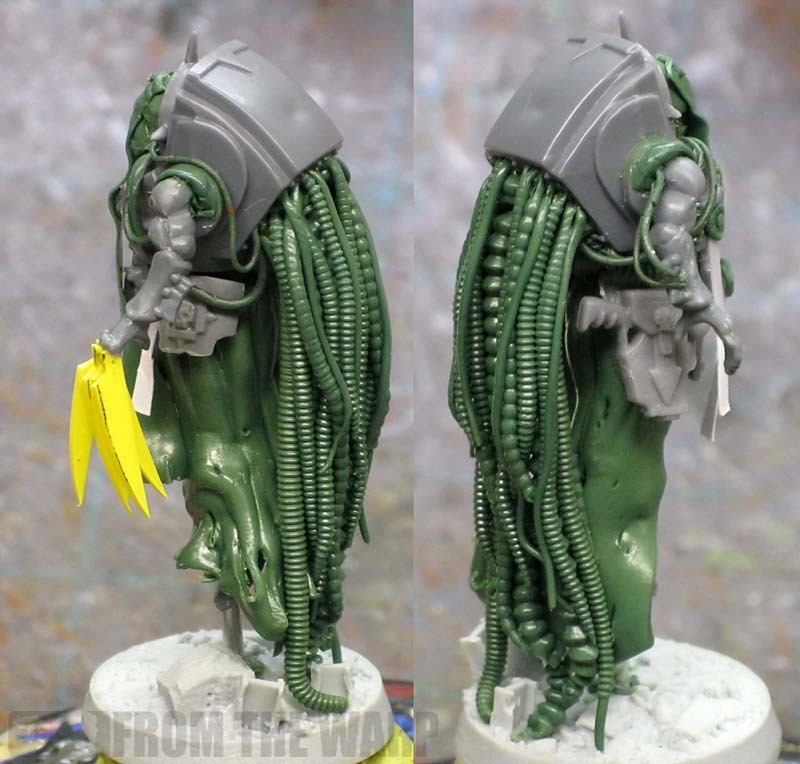 I shared the WIP shots on the Green Stuff Industries blog a few weeks back to show off what I did with the tentacle maker. It was kind of fun to post it over there, I hope it shows others just what can be done with the tool. As far as this tool goes, it's hands down my favorite one. They actually make three sizes, but I prefer the SAW-020. That one has the finest detail and is perfect for making tubes on troop models. Given my choice of this one or any other tube maker, I'll take this one any day. The other sizes they have are slightly bigger and work better for larger models like tanks and maybe dreadnoughts. If you can get all three, do it, if you can only get one, get the SAW-020. Don't kill yourself trying to make cables by hand. I used to do it since I made so many Librarian models, but the detail you can get from this thing is superb. I didn't paint this guy out of the ordinary. My standard fair of basic colors and a good bit of weathering powders to add grime and connect him with his environment. I will say that paint hides a lot of issues on a model and can never be underestimated when it comes to improving the overall completeness of a model. The more I look at it though, the more I see that I could fix in terms of sculpting. I wonder if that's the case will all models you scratchbuild instead of build normally. I'm still very happy with him for what he is... a test model to see if I can sculpt/build something that is not completely organic. If you've got any questions about something in particular on the model, ask away and I'll answer them as best I can. wow!! i love the model man! soo much elegant than 40 and warhammer in general usually is :) good job! He's fantastic, Ron! 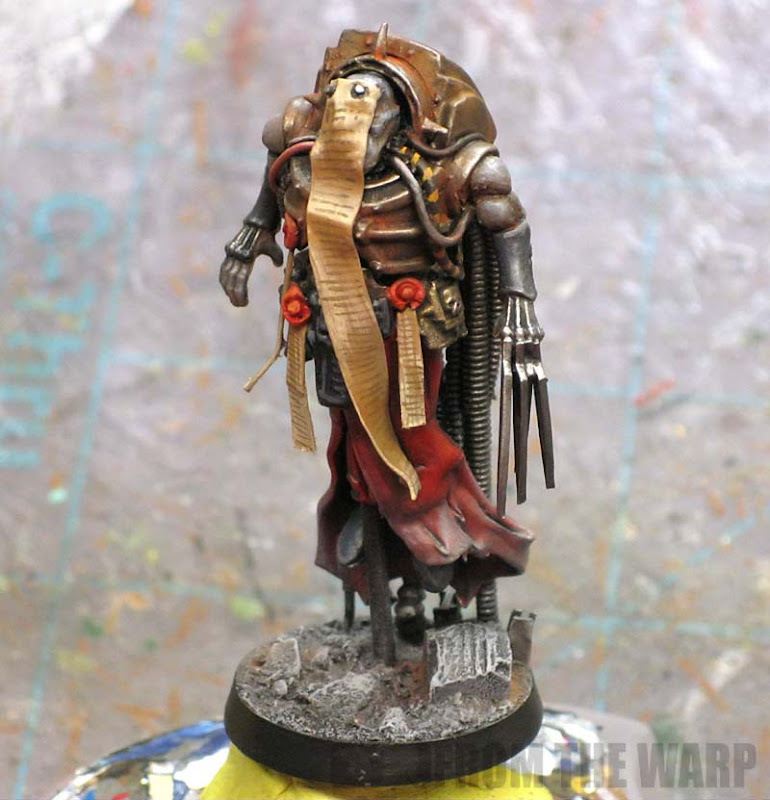 Great job on the cables, and the paintjob really brings him to life. Just the right amount of Blanchian madness, I would say ;-) It would be really great if you could do some more Inquisitor-themed models...maybe even a whole retinue? I have found modelling models for Inquisitor at the 28mm range to be quite a nice change of pace when compared to "regular" 40k. KrautScientist: Thanks, I've actually got enough to do that right now. I'm not sure it would be an effective force though. I picked up Inquisitor Lord Rex (the FW model) the other day and I already have an Assassin model done. And I managed to score a squad of the old school metal Grey Knight models. The original ones with the super ornate terminator armour and helmets. The last thing you want to do when building Inquisitor retinues is to think about how effective they are going to be. Just go crazy and add all the strange and sinister archetypes you like ;-) That's me speaking as a fluffbunny, of course. And while that Hector Rex model is admittedly very cool, I would much prefer it if you did something more individual. Do you want to know why I like FTW so much? Its because you never cease to surprise me with what you can do.Very nice work Ron,I'd be interested to see what you do with other Inquisitor henchmen,or an Obliterator,I saw what GSI came up with in that regard and was amazed at the individuality he achieved,something that the Oblit models really lack.As always keep up the awesome work and eager to see what you do next. This is impressive! You really captured the lore and the idea of what these guys are. Awesome job Ron. If I did more sculpting or scratchbuilding, I'd definitely pick up that tool. Since I'm a boring Space Marine player, I'll stick to Dragonforge's power cable packs. I keep scrolling back up to look at this guy, lol. Wow that's a cool model. This is what this hobby is all about for me, to make/sculpt the models that you want and to put your own spin on things. Awesome work as always Ron.......spot on. Amazing work! the model and the paint work really do resemble John Blanches artwork. Massive pat on the back from me! That is truly awesome Ron - very moody and Blanche-esque to my eye. Absolutely fantastic work! KrautScientist: It would be fun... but after getting my hands on the actual Rex model, he's gorgeous and covered in detail. I may pull out my GK codex and see what kind of force I can come up with. TheRhino: I have some of those cables as well. They are nice and work nicely in certain situations like a cable that hangs low from something or is not laying directly on the surface of a model (unsupported). I like the GSI tool though because it makes it so much easier to position the cables on a figure. Let them cure for a little bit before positioning and the difference is night and day (adds some stability). That and if I mess one up, I can always roll it back out and make it again. I've destroyed more than one metal cable trying to get it positioned correctly. Ginger Kid: I'm going to go through the book to see what else catches my eye that I can build. Wow! That's a pretty sweet model. You've now given me a ton of ideas for the Rogue Trader (rpg) campaign I'm playing in. You're also making it harder to resist playing Inquisitor in 28mm (Inq28 online). I own the tool set as well, and love them. You've made me realize I need to start using them a LOT more! Absolutely love it! Planning on trying this out with the help of the tentacle tools.. I'm not so sure it's 'paint hiding issues' as 'paint revealing a masterpiece'. I'm not creeping when I say this but I'm really quite moved by this miniature - it's disturbing and yet the subtle colours add something special and evocative. I don't what the image was that inspired this but at that moment I see it as a truly unique creation. Thanks for sharing. Varangian: They are perfect for what they do. While you might now have cables on every model, when you need to add them, this is the best way to do it. KrautScientist: I need to stick to one game otherwise I'd never get anything done. Cornu Mortem and Jorge: Thanks! Cypher-77: Good luck, I don't know if I would do it with the amount of work it took while using the tools. I can't imagine not having the right tool in this case. dwez: Believe me, painting hides lots of things. Thanks for the kind words though. neverness: Now Sisters with some "Blanche" style added to them might make for some very interesting looking models. Neil101: Thanks! I don't know if this is the best... I certainly have a good amount of them on there though. 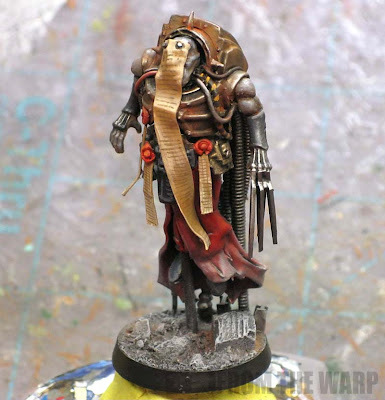 Sometimes I find conversions that I think are impressive. Others make me wish I'd thought of it first. Finally there are green monster jealous conversions and this is one of them. What an amazing piece. From your description it wasn't a complicated build but your choice of colour and the design choices. It oozes atmosphere. The manuscript obscuring the face is perfect. I noticed the nails are piercing the subjects forehead. When I steal your idea they are going to be piercing his eyes. Anon: By all means, use whatever you like. He was a blast to build and I just happy I came close to capturing the feel of the artwork.